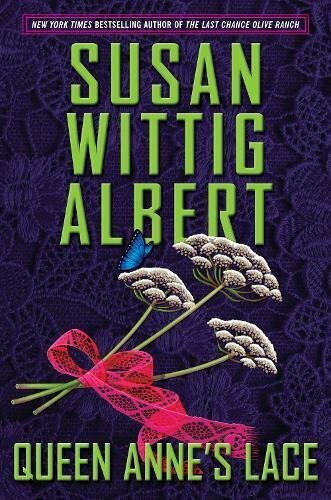 China Bayles is the main character of the 28 and counting China Bayles Herbal Mysteries, a cozy mystery series by Susan Wittig Albert. 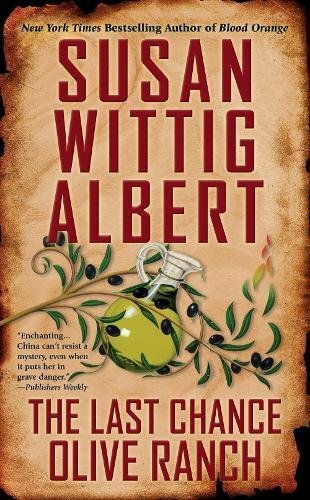 After an intense career as a lawyer, China Bayles moves to the small college town of Pecan Springs, Texas to restart her life as the owner of an herbal shop. China uses her logic and critical thinking skills gained as a lawyer and her knowledge of herbs and human nature gathered as a business woman to solve the mysteries and crimes that she and her best friend Ruby seem to fall into in their not quite quiet little town. 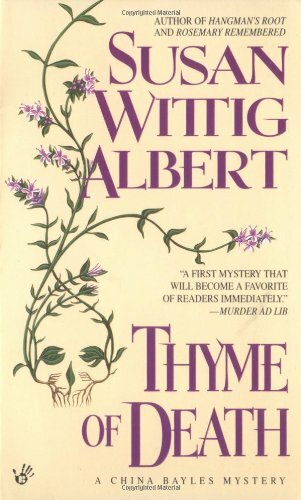 Each book features an herb that figures predominately as the title, theme, and key to the mystery. In addition, Albert sprinkles herbal facts, recipes, and even the occasional craft to support the herbal theme. The generous number of books in the series allows readers to follow the milestones of China’s life in Pecan Springs as her relationships, business, and role in the community grows. China is the kind of character you want to get to know in a small town like Pecan Springs. She’s funny, friendly, and has all the typical concerns and baggage that readers can relate to in a heartbeat like her stress in pulling together a meal after a long day or her musings over wardrobe and weight. China Bayles Herbal Mysteries are the perfect books to savor on a summer weekend while sipping iced tea with something sweet. Albert generously shares through out the series different recipes that China and best friend and business partner, Ruby would serve in their tea shop venture Thyme for Tea or at home. However, this fresh mint tea outlines a simple process that can be done as a quick gather in the garden after work that will be ready in time for a week night supper. Let the fresh herbs, sweetener, and steep in the hot water for 10 minutes in a heat proof pitcher to create a concentrated liquid. Add the ice and let cool in the refrigerator until serving. Remove the pitcher herbs with tongs and serve with a fresh sprig of mint and ice in individual glasses. Add a garnish of citrus and/or melon for extra flavor. China Bayles, lives in Pecan Springs, TX so in honor of her town here are two pecan recipes to snack on while reading about her adventures. Chop the pecans in a blender or food processor until you have two cups. Combine all of the ingredients except confectioners’ sugar. Gather the dough into a ball. With floured hands, shape into one-inch balls and bake on ungreased cookie sheets. Line cookie sheets with parchment paper and spray them with Pam. Bake for 20 to 22 minutes. Pull the cookies and papers off the cookie sheet and onto a cooling rack and let them cool slightly; be sure they’re still warm and then gently shake them in a bag with the confectioners’ sugar. Place them back on the paper and add more confectioners’ sugar while they cool. Makes 5 dozen. Grind the oatmeal and pecan pieces in a food processor until they resemble cornmeal–reasonably fine but with some texture. Whisk the whole wheat flour, cornstarch, ginger, salt and baking soda together in a medium bowl. Whisk in the oat/nut mixture. In another medium bowl, beat the butter with an electric mixer until smooth and light, about 1 minute. Gradually add the granulated and light brown sugar; continue beating until evenly combined, about 3 minutes more. Add the vanilla and the egg. Mix in the dry ingredients to make a dough. Line a 1 1/2-quart loaf pan or 3 mini loaf pans with plastic wrap and pack dough into the bottom half of the pan. Press to level off the dough. Lay a piece of plastic wrap on top and refrigerate until completely firm, about 2 hours. Remove dough from the pan and unwrap. Slice dough in half lengthwise if using a large pan. Slice each log crosswise into 1/4-inch thick cookies. Place the cookies about a 1-inch apart on the prepared pans. Bake until golden brown, 15 to 18 minutes. Transfer cookies to a rack to cool and crisp. Serve. Store cookies in a tightly sealed container for up to 1 week.